We are delighted to announce that all Alumni Community customers will now have a version of their Alumni Community on the web! Watch a quick product tour video here, and see the steps below. We know you are excited to set up the web platform, so follow the steps below to get up and running. All current Community customers will have the web platform enabled, so reach out to genius@evertrue.com if you would like us to disable it for you. Log into Console, or team up with your colleague who has Console administrative rights (most likely your data/advancement services colleague). Once logged in, navigate to the Setup tab. You will be prompted to go to our new Community Admin site. After entering the site, there are two tabs that you will need to reference. Account holds all of your setup for your Community products (web, iOS and Android), including the header and description text for your Community web version. Design contains all of your image assets for your Community products (web, iOS and Android). Begin with Account. Under the Web App section, set your Header text, Description text, and Contact Link. To learn more about the Account section, look here. Next, move to Design. You will need to set a few assets listed below. To learn more about the Design section, look here. Navigate to the Account tab, and select the Web App section. At the bottom of the page, you will find a link to your Community web URL. Your Community is now Live, and you may click that link to log into your Community! Please use the same credentials you use for the mobile applications. This is a great time to check on the status of your data. When was the last time you imported fresh data? 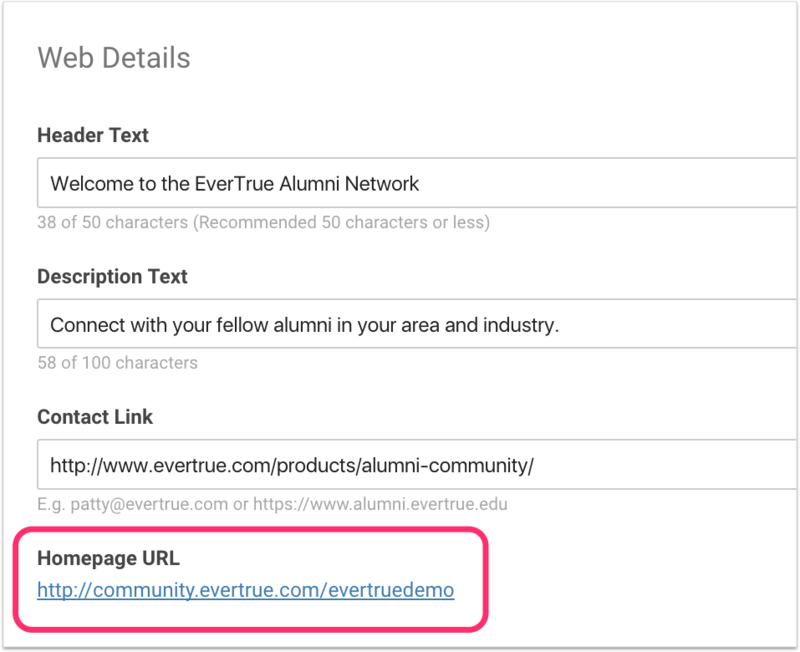 Work with your advancement services team to get a fresh import into EverTrue before announcing the Community web to your alumni! Announce that the web version is live across all channels! Remember, you may reach out to our Support Team at genius@evertrue.com if you run into issues!